Nonstop Venice Flight Tickets, the Best in the world after reading this! Flight from New York JFK to Venice Airport (VCE) with Delta Airlines! Flying the beginning of April until the end of October 1 time a day. Flight from Atlanta to Venice Airport (VCE) with Delta Airlines! Flying the mid of June until the end of August 1 time a day. Flight from Manchester to Venice Airport (VCE) with EasyJet, Jet2.com, Monarch, Thomsonfly, Thomas Cook or Titan Airways! Flying March until the end of October several times a week. Flight from London Gatwick to Venice Airport (VCE) with British Airways, EasyJet, Thomsonfly, Monarch or Titan Airways! Flying every day. These are the direct flights to Venice. I have indexed the prices recently in 2016. 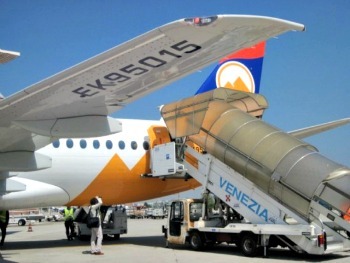 Marco Polo Airport is located in the lagoon of Venice. Try to get a seat on the right side of the aircraft. You will see Venice lying in the lagoon just before landing at the airport. Compare the price if you fly to Venice. Play with the days of your departure. Choose back and return days and see if it's cheaper to stay an extra day in Venice. Tour operators and the airline company want to get the plane full. The more empty seats, the better the price. And for cheap flights to Venice Italy you have to book early! IMPORTANT! There are a lot of visitors on my site questioning about how to arrive at their hotel when they arrive with a budget airline at an inexpensive time 10.30 pm in the night. Make sure that your Venice flight tickets are not too late in the evening. Because an arrival with a low budget airline at Treviso Airport can bring problems when you arrive later than 10.30 pm. You should strongly take into account the transport possibilities from and towards the airport. Another tip is traveling outside the school holidays which occur in Italy and the rest of Europe. Traveling in May, June or September, November are good months to fly to Venice for a cheaper price. Overall, the best price you have in the autumn, winter and early spring. During the Venetian carnival, the flights to Venice are expensive. Book your plane ticket to Venice today. Discover how easy it is to book the cheapest. You've read about Venice tickets. There is plenty to explore. 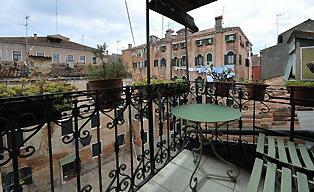 Explore my site on Venice and get more information about this beautiful Italian city.